Toneelspeler. Actief voorvechter van de rechter en de positie van homosexuelen van 1939 tot 1966. Schuilnaam Bob Angelo. Initiafnemer tijdschrift Levensrecht (1939). Actief en het verzet tijdens tweede wereldoorlog. Oprichter/voorzitter Shakespeare Club (1943-1949) en het Cultuur- en Ontspanning Centrum COC (1949-1962). Ridder en de orde van Oranje-Nassau (1986). Actor. 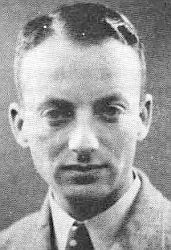 Pioneer of homosexual rights and gay liberation 1939-1966. Wartime resistance worker. Founder of the Dutch Center for Integration of Homosexuality COC. Knight in the Order of Oranje-Nassau. Location. 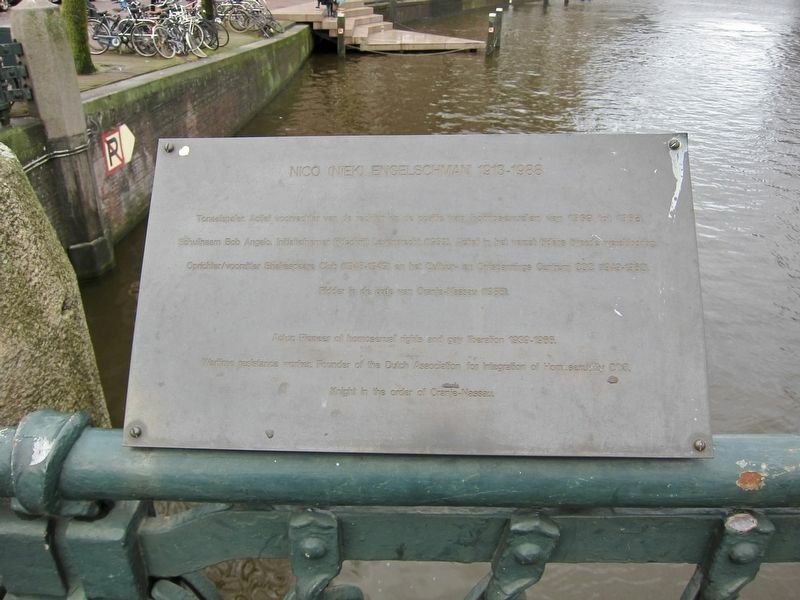 52° 22.445′ N, 4° 53.095′ E. Marker is in Amsterdam, North Holland. Marker is at the intersection of Westermarkt and Keizersgracht, on the right when traveling west on Westermarkt. Touch for map. Marker is in this post office area: Amsterdam, North Holland 1016 DV, Netherlands. Touch for directions. 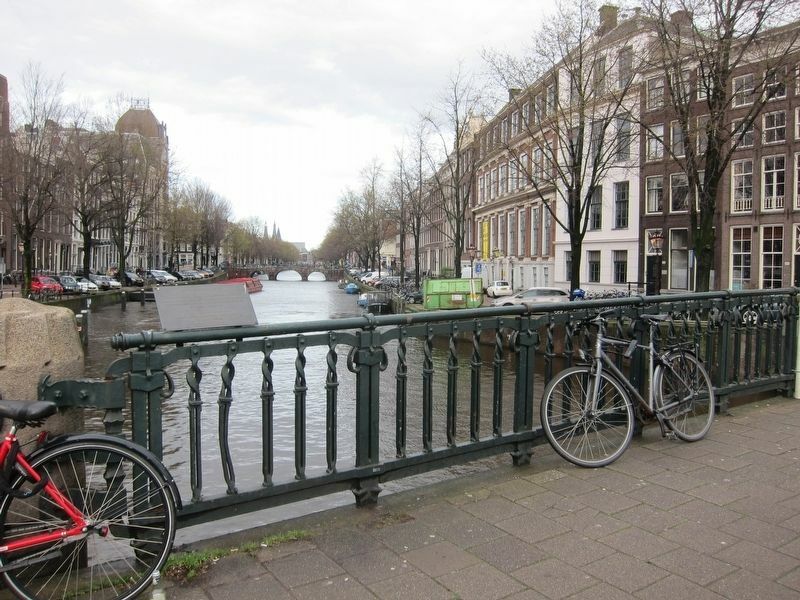 kilometers away); Keizersgracht 456-462 Residences (approx. 0.8 kilometers away); Salomon Verbeeck (approx. 0.9 kilometers away); Jan Pietersz Sweelinck (approx. 0.9 kilometers away); Joost van den Vondel (approx. 0.9 kilometers away); Elisabeth van Oostenrijk / Empress Elisabeth of Austria (approx. one kilometer away). Touch for a list and map of all markers in Amsterdam. More. Search the internet for Nico (Niek) Engelschman 1913-1988. Credits. This page was last revised on March 26, 2019. This page originally submitted on March 26, 2019, by Andrew Ruppenstein of Sacramento, California. This page has been viewed 46 times since then. Photos: 1, 2, 3. submitted on March 26, 2019, by Andrew Ruppenstein of Sacramento, California.